U.S. Interior Secretary Ryan Zinke canoes down the Seboeis River with Lucas St. Clair. If appearance means everything, the date was a success. The weather was perfect and Zinke described the property as a "beautiful and special place." But Zinke has more to consider before he decides whether its designation should remain intact. Zinke's first stop was to the site of a $5 million outdoor education center that's currently under construction. Built and financed by the Baker Conservation Fund, project spokesman Matt Polstein says the mission is to teach kids about outdoor sports and to get them to become future stewards of the land. "We're thrilled to be doing it. We're a little anxious about your review." U.S. Interior Secretary Ryan Zinke at Orrin Falls. Polstein says a change in the monument's status could affect branding. But Zinke said as long as developers share the goals of public access, healthy forests, collaboration and traditional uses, they're all on the same page. Zinke also stopped to talk to a logger who was harvesting on private land adjacent to the monument. Dan Qualey told the interior secretary that the nearest mills are between 50 and 150 miles away. They used to be much closer. "About ten years ago we lost all our local mills," Qualey said. "In fact, there's a few talking about starting back up. It's probably some talk, I guess." Talk or not, Zinke says he's concerned about whether enough wood is getting to the mills. Timber harvesting is restricted on the monument, which has been a concern for Republican Gov. Paul LePage and some in Maine's forest products industry. A sign on property adjacent to the monument. But, for bird watchers, the quiet, mostly hardwood forest, is a paradise. Zinke caught up with a couple of them at the Sand Brook Campground. Anita Mueller, with the group Friends of Katahdin Woods and Waters, said she'd counted 35 species before lunch. And around here sightings aren't limited to birds. "What's the most exciting thing you've seen?" Zinke asked. "I got a pine marten last week. I was thrilled," Mueller said. "I will look up what a pine marten is," Zinke responded. "Cool little critter," she responded. "Thank you," Zinke said. "Thank you and thanks for coming," she responded. Lance Benner of California was making his first trip to the monument this week. He says he thinks it's off to a good start for being less than a year old but could use a few more amenities. "So far I've seen only two toilets. This one and then there was one at the big lookout where you get a nice view over Mount Katahdin," Benner said. "I was unable to find any maps when you come in here. The one that I got was one that I downloaded online and printed. But I think this is off to a good start. This is very welcome development for Maine." 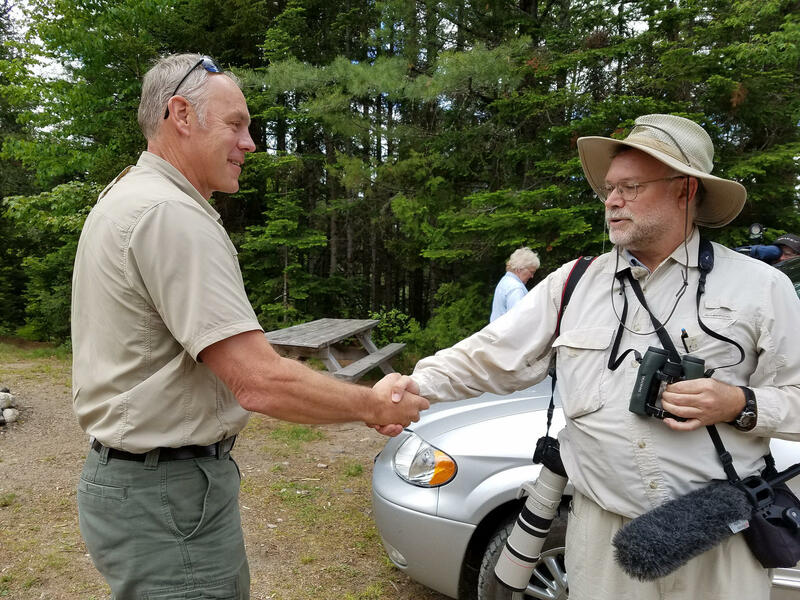 U.S Interior Secretary Ryan Zinke, left, with bird watcher Lance Benner. 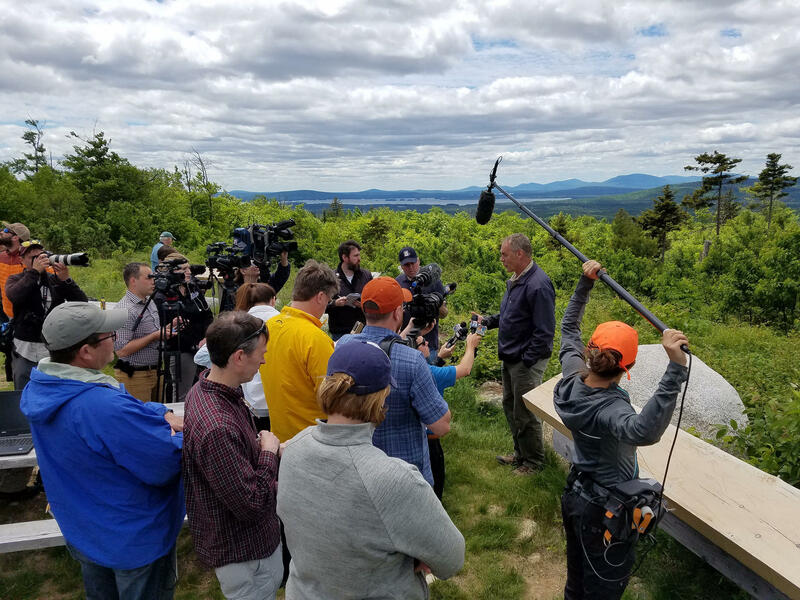 At the monument's scenic overlook with views of Mount Katahadin, Zinke stopped for lunch and told reporters "all options are on the table." He won't make a decision until he's talked to all parties. But, for now, he says he's comfortable with the property being in the public's hands. He just wants to ensure a visit is a good experience. "I just expect if it says, 'Department of Interior' on it, I expect the experience to be five-star. Come in, the rangers and the superintendent are in the right uniform, bathrooms are clean, roads are well done, trails marked and that's the obligation of being a good steward." Zinke addresses the media after a tour of the Katahdin Woods and Waters National Monument. Zinke says infrastructure appears to be a bit behind schedule. As for his review, he says that will focus on whether the law was followed and whether the local community and the state had a say in the process. One option he seemed to dismiss is something Gov. 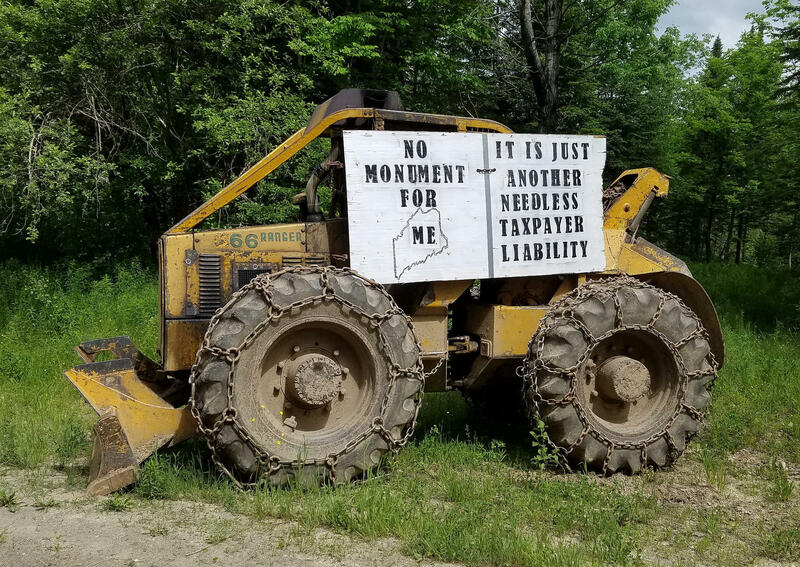 LePage has suggested: transferring control of the monument to the state of Maine. "Management's OK. We can look at management schemes, but I'm not a fan of sale or transfer of public lands." 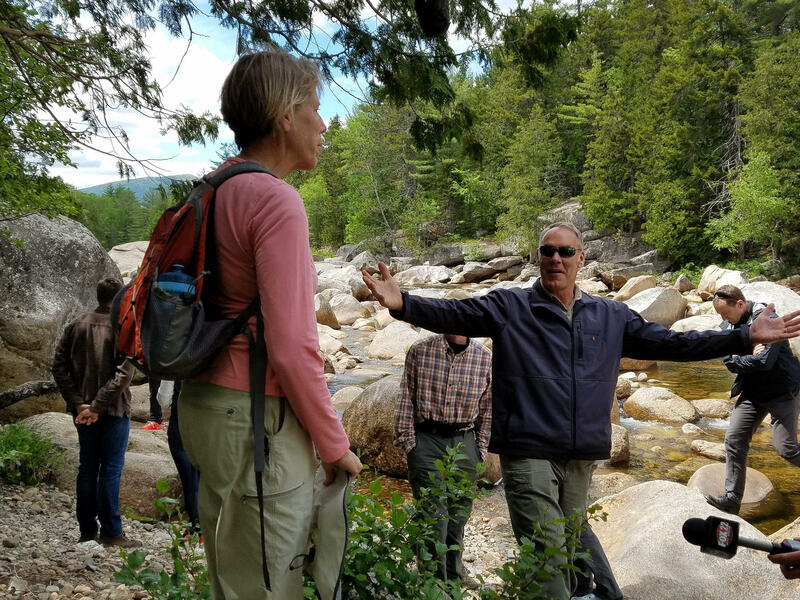 Without naming her specifically, Zinke thanked philanthropist Roxanne Quimby and her family for donating the approximately 88,000-acre property to the federal government. "Everyone should be grateful the public has access to this property," he said. 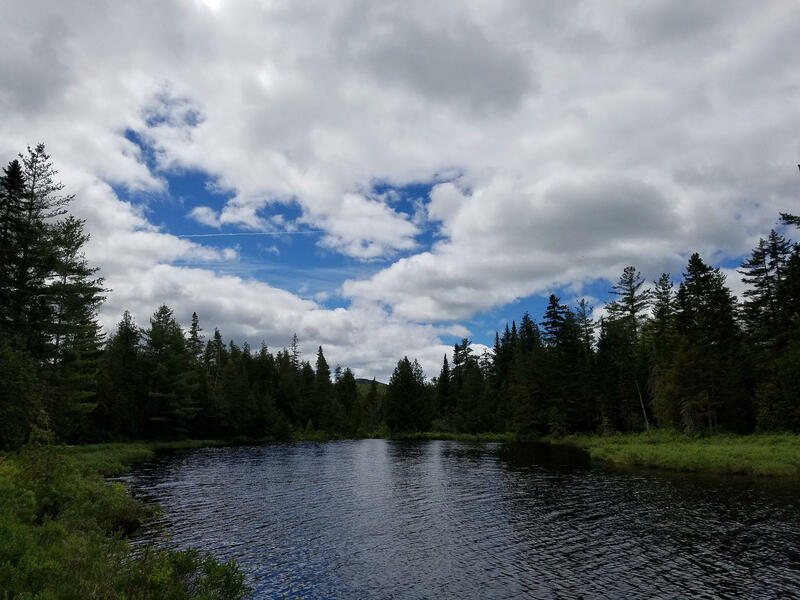 Later in the day, as if to prove that point, he hopped in a canoe with Quimby's son, and took a two-hour paddle down the Seboeis River into the East Branch of the Penobscot. On Thursday, a day after touring the monument, Zinke sat down for a breakfast meeting with several dozen business and community leaders who say they support the project. Zinke says he expects to complete his review and make a recommendation to the president within 80 days. And he told the group that they will likely be pleased with what it is. Later, he told reporters that could include recommending congressional approval for a national park. Supporters have long hoped for creation of a national park which they say would give the region an even higher profile than the monument proclamation does and allow for inclusion of certain traditional uses like timber harvesting. A pond near the Sand Bank Campground in the Katahdin Woods and Waters National Monument.